The Caribbean Climate Online Risk and Adaptation tooL – CCORAL - is an online support system for climate resilient decision making. CCORAL is a system which helps decision makers to see all kinds of activities through a ‘climate’ or ‘climate change’ lens, and to identify actions that minimise climate related loss, take advantage of opportunities and build climate resilient development in their countries. Quick screen - Rapidly assess if your activities (e.g. project, plan, policy) are climate-influenced and a priority for further assessment using CCORAL. Apply a climate risk management process. Find other tools to meet your needs using CCORAL toolbox (containing over 70 tools) Climate-related tools include: vulnerability assessment, risk assessment, adaptation option identification/ appraisal (including financial and economic appraisal), monitoring and evaluation, and awareness-raising. Learn more - Further climate-related information relevant to your country and the Caribbean as a whole. This version of CCORAL has been developed with government users (of any skill level) in mind, particularly those involved in national development planning and finance. 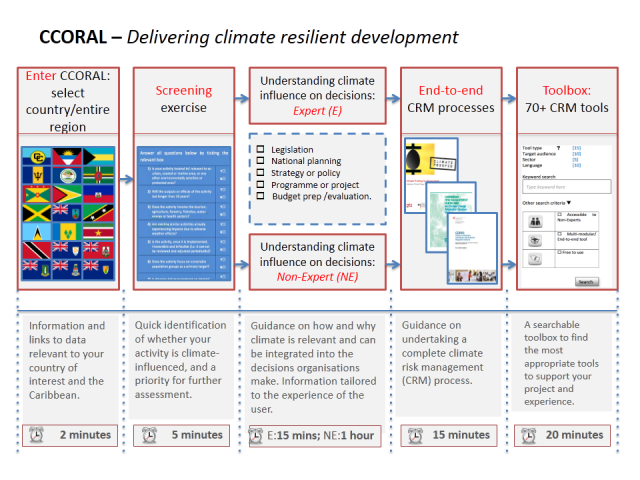 As such, specific guidance is provided for the following types of activity: Legislation National planning Strategy and/or policy Programme and/or project Budget preparation/evaluation CCORAL is designed for users of all skill levels, with resources provided for climate experts and non-experts.